This is the third in a four-part theme week focused on the Spanish Flu and the newly launched Defining Moments Canada project. The Spanish Flu Pandemic of 1918-19 had a profound impact on Canadian culture and public policy. But is it worth acknowledging? 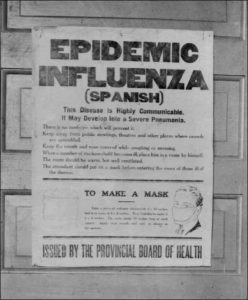 As an approach to teaching the Canadian experience, the Spanish Flu Pandemic could be a poster child for historical thinking skills. Yet in provincial curricula, the Flu can seem like our long-lost Uncle Sparky who we avoid talking about. The Spanish Flu is neither addressed as a specific example nor as a big idea. Is this a kind of historical amnesia? Or is it just an awkward subject that no one quite remembers or understands. Every year, the flu comes back in various forms. It’s back with us once again in 2018, as a kind of annual event that we scarcely give a thought to. But the flu is never quite the same each time it returns. It evolves and mutates. This year’s Flu is known as H3N2. It is related to other strains of the virus that we have heard mentioned in passing: Avian, Hong Kong, Swine. When it swept across the country in 1918, it was known as the H1N1 virus. That evolved into the most devastating plague the world has ever known. H1N1 is directly related to H3N2. In 1918, H1N1 swept across the country and 50,000 Canadians died in just over 18 months. One in six Canadian households was affected by the Flu. One in ten mothers lost their baby during its first trimester because of the Flu, and families were upended and destroyed. The Spanish Flu killed fifty-million people worldwide (although some recent studies estimate mortality as high as 100 million). This Flu killed more Canadians in 12 months than four years of the Great War. And yet Canadian history textbooks give the Pandemic, at best, a passing mentioned in a paragraph amid multiple chapters concentrating on the war years. And now H1N1 is back in an annual, albeit shape-shifting, form. How should we acknowledge and commemorate that pandemic experience of 100 years ago, this paradoxically devastating and all but forgotten seismic event? Perhaps by considering who it struck (not who you might think), and how it spread so fast (victims dying within days or even hours of being afflicted). The stories that can answer these questions are all around us. For the 100th Anniversary of the Spanish Flu, Defining Moments Canada has developed an ingenious workflow for heritage organizations, community groups, and students to engage their families and communities, and to uncover stories of the flu and its impact from that tragically overlooked episode in our history. This is an initiative whose objective is to inspire Canadians to crowd-source a shared digital record – a commemorative mosaic – of the Pandemic in Canada from the perspectives and experiences of the individual. The students’ work, digital and tangible demonstrations of their 21st-Century learning skills, can be shared nationally via Defining Moments Canada’s Digital Commons. This workflow can create an inspiring blend of arts, science, and historical knowledge. Many provincial curricula are in an excellent position to build upon this kind of 21st-century digital conversation about the Pandemic. P.E.I., Nova Scotia, and Newfoundland & Labrador all have independent study units that encourage individual initiative and innovative work of this kind. Student learning outside the boundaries of a textbook promotes digital literacy and environment. It provides opportunities for multi-disciplinary, cross-curricular learning that can be explored easily in a multitude of ways. A story told through the dramatic arts, for example, offers the potential for a student to grow in self-awareness by their critical examination of a subject and also their creative expression of their learning. Every provincial and territorial curriculum promotes inquiry and digital competency. The Maritime provinces have gone further by allocating time specifically for an independent study unit whose subject focus is local to their communities. Defining Moments Canada recognizes this as the kind of work that empowers students for an increasingly digital future. For 16-year-old students across Canada, the science curriculum pays minimal attention to epidemics and pandemics, neither to how and why they erupt and spread, nor to public policy responses. Equally discouraging is the scant attention to the Flu Pandemic in the provincial curricula in the sciences, arts, history, and social studies, not to overlook the weak connections with Indigenous studies. Remarkable presumptions and variations in how (conventional) textbooks deal with the Pandemic reflect an additional facet of the problem. The Flu was seen by some governments of the period as a “cure for the Indian problem.” However, most curricula today are silent on this indictment but offer little else in its place. Given these silences of the past, why is the 100th Anniversary of the Spanish Flu Pandemic an event worth acknowledging, investigating, and commemorating? The answer is: precisely because it had such an overwhelming impact on our country, and yet its importance is so disgracefully overlooked and misunderstood. In preparation for a national crowd-sharing commemoration of the 100th anniversary of the Spanish Flu, Defining Moments Canada did a detailed review of provincial curricula to see how and where the 1918-19 pandemic would integrate, and identified many thought-provoking connections and alignments. Over the course of the project, these alignments will be integrated into the resources available on the site, allowing for teachers to easily integrate these resources into their classroom pedagogies. The Spanish Flu Pandemic may seem like one additional subject to an occasionally congested syllabus. But an event that killed 50,000 Canadians within our grandparents and great-grandparents’ lifetimes needs to be talked about by every Canadian family, community, and classroom. Here we have the opportunity to do so with 21st Century digital innovation. Mike Clare worked with the York Region District School Board for over thirty years, has been seconded to Historica, and was a sessional instructor with the Faculty of Education University of Ontario Institute of Technology. Mike is the author of the iBook Spanish Flu Epidemic 1918- 1919: Stepping Out With The Spanish Lady. ?